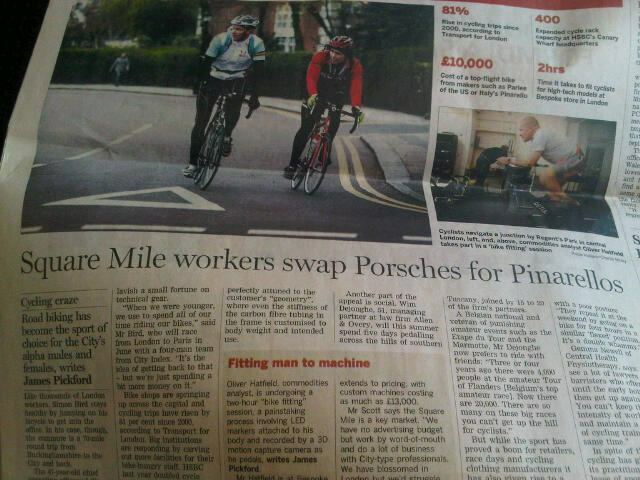 This weekend, the Financial Times carried a story on page three: "Square Mile workers swap Porsches for Pinarellos". I read all about this in the FT on the way back from a surprise trip to Copenhagen. Where cycling looks rather different. 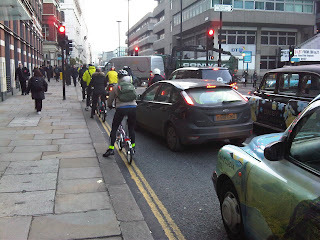 There were plenty of folk dressed in lycra this morning pedalling down the city's bike lanes on their fancy road bikes. 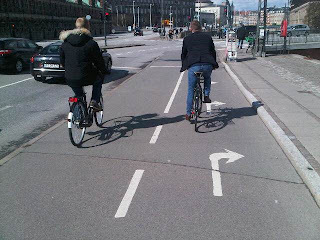 But for the most part, people cycling around in Copenhagen looked a bit like these chaps on the bike path crossing over one of Copenhagen's bridges (pic on the right). I was cycling right behind them and couldn't help thinking how different this Copenhagen bridge looked to the bridges in London where cycling looks a bit more chaotic. The contrast is shocking. I hadn't been to Denmark for a few years and so I'd forgotten some of the detail. What struck me this time was that Denmark isn't so different from the UK. There are plenty of drivers racing about, doing what people do when they drive. 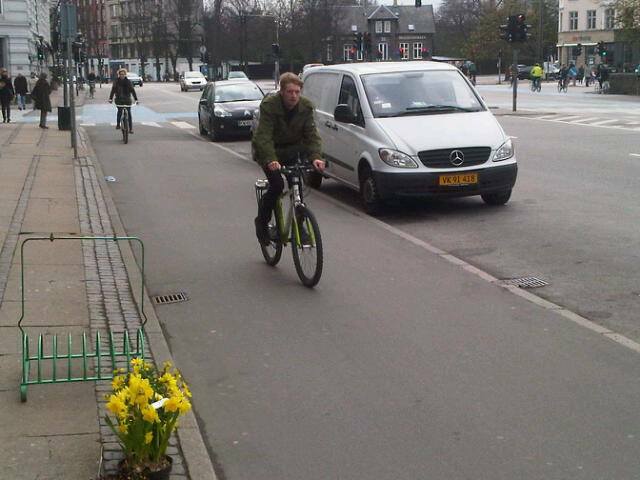 But the real difference is that there is real bike infrastructure almost (but not entirely) everywhere. Instead of having to squeeze into a few spare centimetres alongside moving cars, you spend a lot of your time cycling well away from fast-moving motor vehicles, like the folk in these pictures. As you move about, you realise that someone has thought about how to get you safely from A to B whether you're on a bike or in a motor vehicle. You get the feeling that Copenhagen has decided what and who its streets are for. Copenhagen's Mayor said very clearly last week that the city's streets were about giving space back to people and taking it away from being the near-exclusive domain of motor vehicles. Compare and contrast. Where would you rather cycle? ﻿The question of who are streets are for is going to take a new turn in London this week. The founder of AddisonLee has apparently instructed his minicab drivers to take to London's bus lanes, claiming that keeping minicabs out of bus lanes "denies the public freedom of choice as journey times in the bus lanes are much quicker that those outside the lanes." This morning on BBC Breakfast, Addison Lee described its exclusion from bus lanes as 'discrimination'. One way of another, Addison Lee has hit the nail on the head. The question Addison Lee is asking who are London's streets for? Are they for the benefit of 'people, urban life, and shops', as Denmark's Mayor thinks they are? Or are the streets meant to be places where people can travel 'quickly', the way Addison Lee describes them? I have a feeling Addison Lee might have put its finger on a much bigger issue than it realises. For my part, I think the people being discriminated against on London streets are people in buses, on foot and on bikes. Bus lanes are being shortened so that we can fit more private motor vehicles through junctions and investment in bus lanes is being cut. Bike lanes are, for the most part just blue paint. Pedestrian crossing times are being reduced so that we can move more private motor vehicles around the city more quickly. I certainly don't see why people in minicabs should get more of London's roads given to them, nor why they should be given more priority than people in buses or on bicycles. I also don't see why London streets should be designed simply for 'quicker' journeys for people in private motor vehicles. I think London streets should be places where everyone can make journeys safely and conveniently, whether that's by bike, on foot, in a bus or by car or van. But if you make the streets places where minicabs get priority to travel fast, you reduce the ability of everyone else - bus users, people on bikes, people crossing the road - to go about their own business safely and conveniently. I'm fed up of being intimidated on London's roads by drivers weaving in and out of traffic, cutting me up on my bike. And minicab drivers, as far as I'm concerned, are the absolute worst of the bunch. Fundamentally, I don't have an issue with minicabs being given access to bus lanes. But not until people on bicycles get proper infrastructure that keeps them well away from speeding minicab drivers on a mission to get around London as 'quickly' as possible. Not until pedestrian crossings are weighted in favour of pedestrians, not in favour of minicabs and private motor vehicles to make 'quicker' journeys. And not at the expense of bus passengers and their journeys. It makes me even more determined to join thousands of likeminded people at Hyde Park, 11am on Saturday 28th April to tell AddisonLee our streets are for people. Fine, have your bus lanes but not until the streets are weighted to give the majority who aren't in small motor vehicles equal priority. I'm really looking forward to seeing TfL take Addison Lee's operator's license away. It would probably be about the single most positive thing TfL would have contributed to road safety during the whole of Boris's first term of office. And, I should add, hopefully also Boris's only term of office. I do think he has scored a bit of an own goal on the journey times though. The whole reason journeys are quicker in the bus lanes is because they are only used for buses, taxis and bicycles (and in some areas motorbikes & scooters) however opening the lanes to Addison Lee as well as presumably all the other PHV vehicles (otherwise that would be discrimination of the same type the chairman seems to sure is unlawful....) will just make it worse for ALL the lane users. The point is that if black taxis can use the bus lanes, how can minicabs be kept out? As a cyclist i don't want either in the bus lanes but i don't see why one should be allowed and not the other... neither are public transport after all and most of the black cabs in the bus lanes aren't even carrying passengers. Addison Lee are the worst for dreadful behaviour towards cyclists - I've lost count of the number of times I've almost been knocked over by one of their MPVs. There's a definite pecking order for bad driving and minicabs are the worst, followed by white vans and (a distant third) lorries. I don't seem to have an issue with traditional black cabs or buses - the latter always seem to give plenty of room, with the notable exception of one London bus company that, in an ironic twist, is owned by the Dutch state railway company! Do I detect a trace of disapproval for 'folk dressed in lycra' on 'fancy road bikes'? Emily, nothing wrong with fit cyclists going briskly in whatever they want to wear. But some can't go fast, some can't be bothered, and none should have to. Not at all. I often dress in lycra and whizz on a fancy road bike. Not quite as fancy as some of the bikes you see in the City, though. My point is that you can be an 'experienced' cyclist and just be someone wearing jeans and a shirt who wants to cycle to the shops or the cinema or to friends and just use it as a transport mode, not as a sport. I do both. My employer, a "Big 4" accounting firm, is one of AdLee's largest customers. We are supposed to book through Adlee in preference to using black cabs. Having seen the Bikebiz article I forwarded it to our director of corporate social responsibility, asking him to take action to remind Adlee that we cannot countenance explicit lawbreaking by one of our suppliers and that the contract could be terminated if they persist. (As a regulated business, we are acutely sensitive to issues around observance of law). I hope they deal with this firmly. Anyone out there who can make similar representations to their transport department/CSR csar, please do. I assume that the justification for permitting black cabs to use bus lanes is that there are, still, relatively few of them. The barriers to entry, in the form of "The Knowledge", are significant and while they don't have to apply for a licence, or pay a material sum for one, the six months in school controls numbers. Whether they deserve the privilege in objective terms is of course, another matter, but I can live with it. Cabbies are already up in arms about Adlee in particular over the Olympics. Adlee has the sponsorship contract for 2012 and is the only permitted picker-up of fares from the stadium, so cabbies, who are obliged to take fares *to* the stadium can't get one back, and potentially face loss of earnings as a result. I also understand that Adlee has the contract to ferry the 2012 "Nomenklatura" around in cars supplied by BMW (another sponsor - Adlee normally uses Galaxies and Mercs) using the "Zil lanes". Not sure wheher they have the privilege for their other business but wouldn't be surprised. On the subject of bikes in the City v Copenhagen, I was heartened to read Clarkson's comments on the subject of Copenhagen bike lanes. I know many people regard him as a petrol-headed prat but I would prefer to give him some credit for being a sharp cookie - after all he has climbed the ranks of Auntie's presenters pretty high – who maintains a certain persona for public view while having a more thoughtful interior. True, some of his remarks were off the mark. I see far more Pinarellos (or at any rate smart road bikes) than I see beards out there. Anyway, it would be interesting to know more about his considered views on the subject of cycle separation: is it just to provide more space for more or faster cars, like that berk Quentin Rayner evidently believes? Or does he genuinely think that cycles and fast/heavy motorised traffic don’t mix, even if seen from a driver’s perspective? There are some bad black cab drivers around, and some bad bus drivers, but Addison Lee see to be universally terrible. I can't help but feeling it's a conscious company policy - I've heard a number of people compliment Addison Lee's drivers on their politeness and smart appearance which suggests 'training'. However, their treatment of other road users, whether on bikes on in cars, is terrible. To reiterate someone else's point, when you're on a bike a black Ford Galaxy spells 'danger'. The key difference between Black Cabs and minicabs is that the former are on a meter whereas the minicabs are on fixed price. That means they're in a hurry as quicker drops mean more earning potential which makes them inherently more dangerous - there's nothing worse that a driver in a hurry. @Unknown - I htink you are spot on there. Adlee drivers work under conditions similar to the chair rental system adopted by hairdressing salons. They are "self-employed", paid by the journey, and they have to pay back to the company for the use of the car. Unlike black cabbies, who really are self-employed in the true sense, they are generally paid by the trip, in distance bands which are probably dearer than a cab at the lower end of each band and cheaper at the top end, but make no allowance for traffic conditions slowing you down. Cabbies get fares from a combination of distance and time so are not so disadvantaged by traffic delays. The remuneration model for Adlee drivers positively encourages them to drive too fast, cut corners, jump lights and take risks which a cabbie would not take. It is not that Adlee drivers are bad people, just as not all cabbies are paragons of motoring virtue. In fact, the business model for most road haulage, courier/delivery (including cycle couriers) and private hire car positively increases road danger, through bogus "self-employment", piece rates, and excessive pressure on drivers to deliver ever more productivity. That is something which Boris or Ken have zero control over. The hairdressing business model works for hairdressing - if you get a crap haircut it is not exactly life-threatening - but it has no place on our roads. 1. The FT misses the point that everyone who switches to a Pinarello for their commute is one less car in the city, a reduction in the london pollution levels, and generally a good thing. More subtly, it gives people on bicycles more political strength as it stops cyclists being viewed as the underclasses of society. Based on the Bristol experience, minicabs in bus lanes are the worst vehicles to share with. They also seem rather fond of ASLs. Perhaps Addison lee have declared that not letting them use ASL, bike lanes and bike paths is discrimination and that they should ignore the "outdated" legislation. I tend to feel I get more respect on my bike from black cabs and as a result give more respect, why is this? Well there's the knowledge and all the work that takes, but also the small factor that most (all?) cabbies spend £32000+ on their cab. Minicabs cost £20k tops and are owned by other companies. in other words, dent it and it's someone else's problem. I do like the little tfl sticker on minicabs though - it's a handy warning! Never quite sure about the Copenhagen comparison. Strikes me as similar to all those reports braying about Cambridge's cycling infrastructure. Much less complex and busier cities than London - of course it's easier to pacify these kind of places with cycle infrastructure. 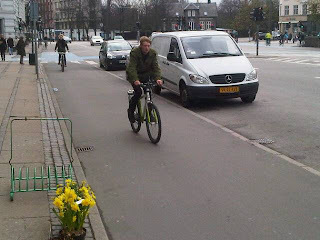 That said, I understand it hasn't always been this way and Copenhagen's cycling renaissance (much like that or Portland) only came about through a conscious decision by the city fathers in mid-1970s. So change is possible. Long term answer for London has to be Dutch style cycle lane arrangement with car parking spaces outside the actual cycle lane, thereby effectively shielding cyclists from the main carriageway with a barrier of parked cars, whilst also reducing risk of unobservant drivers opening doors into cyclists. See LCC proposals etc. What to do with narrower London streets is anybody's guess, although having cycled all over town on Sunday I was reminded how much safer the roads feel at weekends. Lighter traffic, dare I say it more Copenhagen-esque. Long term target surely has to be reducing the amount of single-occupancy vehicles in London, as well as ensuring trucks do their deliveries overnight rather than during peak hours. It's ridiculous that HGVs have to queue up places like Wardour Street during morning rush hour - make the lazy buggers get up earlier! All cabs should be banned from bus/cycle lanes unless they're carrying passengers (ideally multiple passengers). All cabs should be penalised for moving around empty - every metre with the yellow light should cost them money. There are over 20k black cabs - and more minicabs - think what an improvement to the congestion is they cut down their movements when empty. Surely if we section off parts of the highway for commercial use it is discrimination not to allow ALL commercial vehicles to use them. Whats the difference between carrying people or carrying goods after all they are ALL using them to make a PRIVATE profit. when it can be used by taxis, why shudn't the PHVs use it. What makes a difference between taxis and PHVs? Both are of same category.